Ingredients: Organic Peanut Butter, Organic Rolled Oats, Organic Brown Rice Syrup, Organic Oat Flour, Organic Cane Syrup, Organic Date Paste, Organic Pea Protein, Organic High Oleic Sunflower Oil, Organic Rice Starch, Organic Tapioca Syrup, Organic Palm Oil, Organic Peanut Flour, Organic Dried Cane Syrup, Organic Rice Flour, Vegetable Glycerin, Organic Unsweetened Chocolate, Organic Brown Rice Protein, Organic Cocoa, Natural Flavors, Sea Salt, Organic Alkalized Cocoa, Sunflower Lecithin, Mixed Tocopherols (Antioxidant). Allergen Statement: Contains peanuts. May contain soy, wheat, tree nuts, and traces of milk. Chocolate and peanut butter --- what's not to like here? 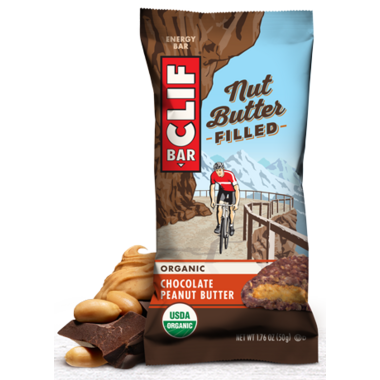 My fav of the Clif Bars. I wish Well.ca would offer these in the 12-packs more often.... Yummmm! Is the best i tried so far!!! very tasty and nutritious! will keep buying this for sure ! These are awesome!!! delicious and nutritious - what a combo! Very satisfying!